Main purpose of the assessment: To provide economic assessment of environmental initiatives. It is a long-term oriented cost accounting method which pays specific attention to identifying hidden, less tangible and liability costs. Description of the methodology: TCA methodology encompasses a broad decision-making perspective and incorporates sustainable development considerations through identification, compilation, analysis, and use of environmental and human health cost, both internal and external information associated with a business decision. Total Cost Assessment (TCA) is a financial tool used to provide a more complete assessment of the true profitability of business investments and operations. It has been used to evaluate alternative capital investments, operational expenditures and procurement decisions. In most cases, it is used for assessing the costs and benefits derived from the environmental initiatives and policies to support decision making (Beaver, 2000). TCA is a useful tool for identifying, analysing, and improving cost estimates in key areas such as energy, waste, and prevention management, both internally and externally. It can incorporate a wide spectrum of costs and benefits in business cases for all new product and process projects, focusing on internal and external considerations. TCA pays specific attention to identifying hidden, less tangible and liability costs (Curkovic and Sroufe, 2007). Less tangible costs are, for example, consumer acceptance, corporate image and external relations. Liability costs are fines due to the liability for such things as future clean up, health care and property damage. The TCA approach thus also focuses on the risks and hidden costs associated with a product or activity. Usually, it captures a longer time horizon using the net present value (NPV) to discount future cash flows. It is used in many companies to compare investments in cleaner production. Centre for Waste Reduction Technology (CWRT) has developed this approach specifically for the identification, compilation, analysis, and use of environmental and human health cost information associated with a business decision (CWRT, 2000). CWRT’s methodology is based on a life cycle approach, taking a wider view of potential environmental and health risks and costs (Figure 1). This methodology consists of six main steps with a final step being a feedback loop providing input into the company’s main decision process. The purpose of the first three steps is to clearly define what aspects of the project or alternatives are important enough to carry forward and to fully evaluate. Once the first three steps have been completed, the financial inventory is developed for each project or alternative. The first step, Goal defining and scoping, requires a clear identification and definition of the project and purpose of the TCA analysis. The second step, Streamline the Analysis, refines the first step by connecting the objectives and other elements of the decision at hand to sustainability metrics and impact (environmental, health and safety) categories. This step also provides for the incorporation of life cycle information and other critical information (e.g., results of LCI/LCA or brainstorming sessions). The third step, Identify Potential Risks, evaluates the relative importance of the impact categories based on the current feasibility of expressing the costs for each category for an alternative or project. The fourth step, Conduct Financial Inventory, focuses on defining the five types of costs, as summarised in Table 1. Type I and Type II costs are generally included in conventional corporate accounting methods. There are significant uncertainties associated with establishing the magnitude of the Types III, IV, and V costs and probability of occurrence, therefore, the TCA methodology focuses significant attention on them. Type I: Direct costs Direct costs of capital investment, labour, raw materials, and waste disposal. These may include both recurring and nonrecurring costs. Includes both capital and operating and maintenance (O&M) costs. Type II: Indirect costs Indirect costs not allocated to the product or process (overhead). May include both recurring and non-recurring costs. May include both capital and O&M costs. May include outsourced services. Type III: Contingent and liability costs Contingent costs include fines and penalties caused by noncompliance, future liabilities for clean-up, personal injury and property damage lawsuits, natural resource damages, and industrial accident costs. Type IV: Intangible costs Difficult to measure cost, including consumer acceptance, customer loyalty, worker morale, worker wellness, union relations, corporate image, and community relations. Type V: External costs Costs borne by parties other than the company (e.g., society) including deterioration of the environment by pollutant dispersions that are currently in compliance with applicable regulations. The fifth step, Conduct Impact Assessment, involves conducting data analysis and review of the TCA results to determine the largest cost contributors for each category and to assess how that information may be best incorporated into the overall decision process. The sixth step in the TCA, Document Results, is to document the assumptions and results of the TCA. Finally, as shown in Figure 1, the last step, Feedback to Company’s Main Decision Loop, is a feedback loop to the main decision process within the company. This step recognises that the TCA is only one element or input to an overall decision process that needs to include many types of information. TCA can be carried out manually using spreadsheets (CWRT, 2000) or with the help of software packages (Norris, 2001). Large chemical companies such as Dow Chemical have used this method to assess costs of environmental, health and safety (EH&S) measures (Koch, 2002). Since TCA is a support tool for making informed decisions regarding environmental and health improvements, having a detailed understanding of the pollutants generated and the human health exposure effects for a product or process is essential. The outputs from LCI can serve as inputs for the TCA methodology, where they are translated into an economic value. 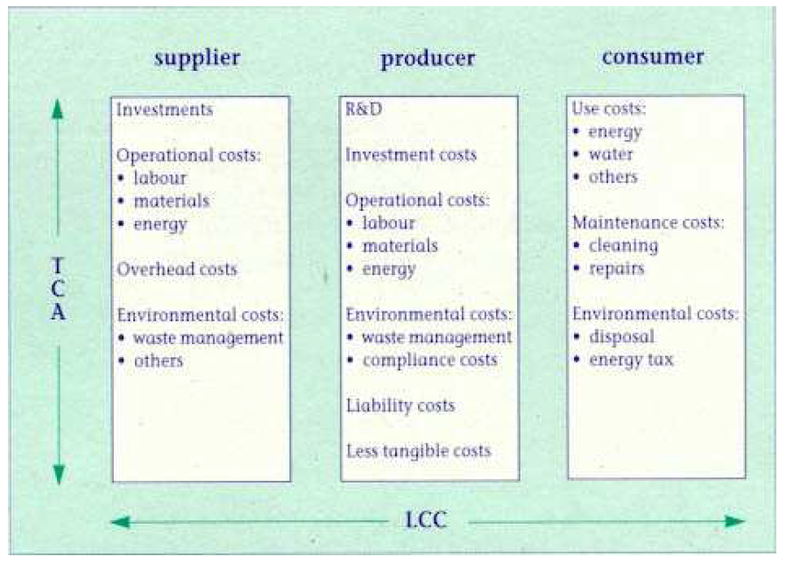 TCA is a tool similar to Life Cycle Costing (LCC), but has a focus on one particular project and usually also includes intangible costs (UNEP, 2005). It gives an in-depth analysis for one specific actor in the product chain, the producer, thus providing a cost assessment in the vertical dimension. Figure 2 shows the relationship between LCC and TCA. The main difference between conventional cost accounting and TCA consists in accounting for ‘hidden’ or ‘less tangible’ costs, including costs for environmental protection. These costs are also included in conventional cost accounting, mostly in the form of overheads, but they are not attributed clearly to a special product system. As in LCA, this clear attribution to a product system is important for assessment in order to estimate the true costs or true environmental interventions of the product (system) to be compared with another one which fulfills the same function or has the same benefit. TCA and other costing methods, such as LCC are the economic counterpart of LCA. TCA methodology is capable of fully integrating a life cycle inventory for a product or process evaluation. – considers uncertain or less quantifiable costs. External costs, costs which are not paid directly by the company, but which are borne by neighbours and society, can also be factored in the method. Thus it supports the understanding of environmental and human health costs and impacts related to projects, accounting for both internal and external costs. TCA is useful to companies that strive to improve the ‘triple bottom line’ performance. It reveals a more complete cost per process or product than traditional ledger values. These costs can then be considered by decision makers in targeting process improvements, modifying product lines, and other business strategies. TCA only gives an in-depth analysis for one specific actor in the product chain, the producer, thus providing a cost assessment in the vertical dimension. Other relevant actors in the product chain (for instance suppliers and consumers), the horizontal dimension, are not generally covered. Intangible costs are difficult to measure because they are associated with subjective (though potentially measurable) perceptions of management, customers, employees, communities, and regulators. It can support decision making on product improvements. TCA can be used by companies to achieve their sustainability and eco-efficiency goals through the objective identification of all risks and costs that are associated with various processes and decisions. 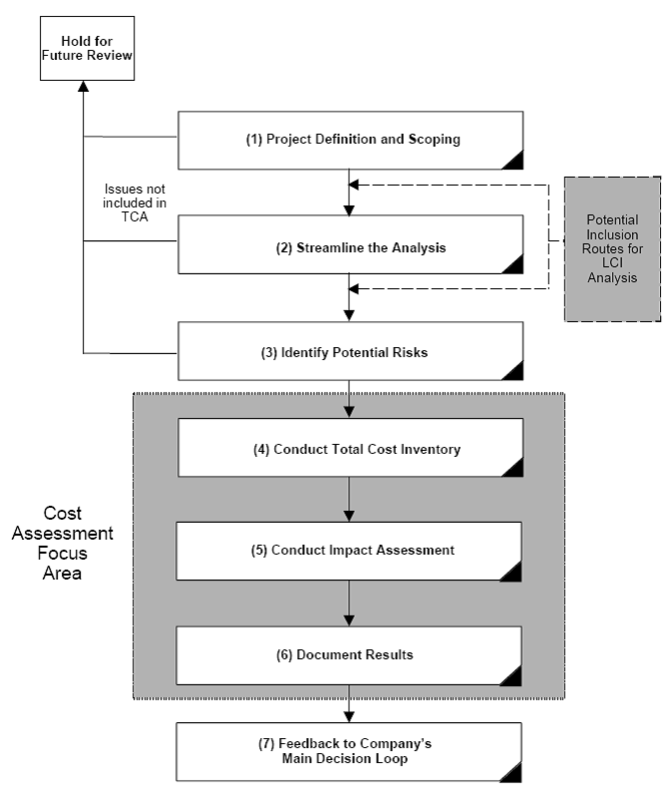 Total cost assessment (TCA) methodology is designed for internal managerial decision-making. 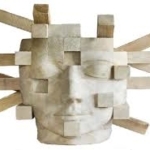 The model and concept were developed to be sufficiently flexible to meet the needs of the user groups, with a sufficient level of documentation and instruction to produce consistent results. A standardised, widely-accepted approach to conducting a TCA has yet to be fully developed and widely tested. Beaver, E. (2000) LCA and Total Cost Assessment, Environmental Progress, 19 (2): 130- 139. Curkovic, S. and Sroufe, R. (2007) Total Quality Environmental Management and Total Cost Assessment: An exploratory study, Int. J. Production Economics, 105: 560–579. CWRT – (Centre for Waste Reduction Technology) (2000) Total Cost Assessment Methodology, AIChe ISBN 0-8169-0807-9. Koch, D. (2002) Dow Chemical Pilot of Total “Business” Cost Assessment Methodology: A Tool to Translate EH&S “…Right Things to DO” into Economic Terms (Dollars), Environmental Progress, 21 (1): 20-28. Norris, G. (2001) Integrating Life Cycle Cost Analysis and LCA, Int. J. LCA 6 (2): 118-120.